Many authors enjoy adding twists to their stories, that is, events that surprise readers, often at the climactic stage. We want readers to gasp and say, “No! That didn’t really happen!” This creates a spike in emotions that helps make your story memorable. Since we want to surprise readers, we might wonder if we should foreshadow story twists. Will foreshadowing ruin the surprise and minimize the desired gasp? We should foreshadow twists. My experience tells me that an unforeshadowed twist annoys readers. While they might enjoy being surprised, they don’t want to be betrayed. They don’t want to be shocked by something they couldn’t possibly see coming, that is, a shock that is unreasonable, out of the blue, or a violation of the elements you have set in the story. For example, if your hero dies, that is often a big twist that readers might or might not accept. If a piano randomly falls from a window and smashes him, and no story-related reason exists for the death, then readers might throw your book across the room. Yet, if he dies because of a carefully prepared series of events that aids the story, then readers can accept it even if they are shocked by it. Still, you can foreshadow a twist without giving it away. This will protect your desire to deliver a gasp while avoiding reader annoyance. And that is the key. We don’t want readers to see the twist coming, but we do want them to believe they should have seen it. Every twist should adhere to the story’s foundational elements, and the twist must have a purpose. If the twist ignores either of these, readers will feel betrayed. 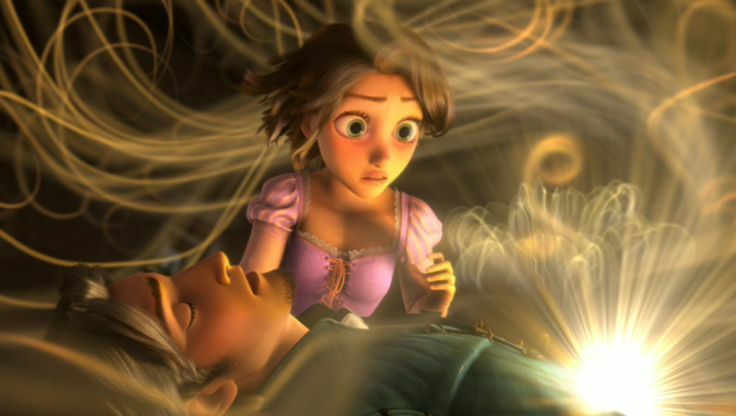 In the film Tangled, a story twist raised a literal gasp in me. When Flynn Rider (Eugene) cut Rapunzel’s hair, his action shocked me. What a great twist! Why was it great? Because, although I didn’t see it coming, it took only seconds for me to realize how well it worked in the story. The writer foreshadowed every element of the twist without giving the actual twist away. Although Rapunzel’s hair was a treasure of priceless value, it was also the reason for her captivity. The only way to set her free was to separate it from her. Also, Flynn’s story arc demanded a redemptive act that could not be denied. He knew that rescuing her would result in his death, but love and a redeemed heart combined to launch his compassionate and selfless act. The story foreshadowed the cutting’s effect on her hair and on the villain. It foreshadowed the crippling of her healing ability. It even foreshadowed the tool Flynn would use to cut her hair, a fragment from the broken mirror (which was also an appropriate symbol). Without all the foreshadowing, the twist would have been flat and ineffective. Foreshadowing made it powerful and memorable. The next sequence in the film, however, bothered me greatly. After such brilliant storytelling, I felt betrayed by how the writer saved Flynn. After seeing the film a few times, I still couldn’t see how it was foreshadowed. One day I decided to sit down and watch the film, searching for any foreshadowing of this scene. I couldn’t believe that such a talented writer would omit such an essential element. It didn’t take long to see it. No need to watch the whole thing. Notice the part from 0:20 seconds to 0:35 seconds. A drop falls from the sky. When it hits the ground, it creates a healing flower, which foreshadows the teardrop falling and healing Flynn. Go back and look at his healing. After the teardrop falls, at the site of his wound, you will see a burst of light that takes the shape of the healing flower. The foreshadowing is there, and it is beautifully done. I just missed it. My feelings of betrayal were wiped away. This story is exceptional, because the writer employed foreshadowing with deft expertise through every sequence, even the stunning twist and healing. Do you have any thoughts or questions on foreshadowing? Please post a comment. I hadn’t seen the parallel between the falling drop of sunlight and the falling tear! Beautiful! Thank you. I will look into the thumbs-up issue. It works for me. It might have something to do with permissions. Wow, that’s amazing! I’d never thought about how they foreshadowed Eugene’s healing! It kind of bothered me, too, but now I know. Thanks for the tips on foreshadowing! Those will probably come in handy. Changed my name on here from Autumn to Autumn Grayson since on another site there’s another commenter with the username Autumn. Anyway, an interesting example of foreshadowing was in one anime I saw where the main character(who is the villain) is basically playing this dangerous game/goal and the second main char, a detective, suspects him and is trying to prove he is the murderer the whole time. The story is exciting because the possibility of either char dying is obvious, so it’s foreshadowed from that standpoint, but there are really no guarantees, so character deaths can still feel like a tragic plot twist for those who’s favorite character dies. Good point. Foreshadowing multiple possibilities allows for many surprises. Not all foreshadowing has to come to fruition. It just has to intimate a possibility. That’s part of what makes what actually happens a surprise. Those are often called red herrings. Although many writing teachers include red herrings in the category of foreshadowing, I prefer to exclude them to prevent confusion. If a “foreshadowed” event never happens, then the clue isn’t foreshadowing anything, because the clue leads to nothing. When there is no real event to foreshadow, then a clue isn’t true foreshadowing. It’s definitional. One could say that foreshadowing isn’t a foreshadow if nothing ever comes from it. On the other hand, defining the world isn’t a bad thing. If one defines that drops from the sun yield healing powers, you do not HAVE to do anything with that, it just might help define the world better. (it’s magical, there are such things as sun tears, etc). You might call it differently than “foreshadowing”. A “red herring” is a way to mislead and misdirect someone. Not quite what I had in my thoughts as I posted. Or foreshadowing can also make people think that, say, a character is going to die. But by the end of the show the audience realizes that the author was actually foreshadowing something different. Like, say, a specific danger a character would later throw themselves in or even just the fact that they are going to face extreme danger. OH MY GOODNESS! Thank you for clearing up the foreshadowing thing with the healing! That has bothered me ever since I first saw the movie!!!!!! Otherwise they are just there to shock. Foreshadowing changes a shock to a surprise. A bad to a good. Even if the “good” is a death, a corruption, a redemption, or a new direction. And maybe I just got lucky, but I saw the flower in my very first viewing. For me, it showed that the hair was a mechanism of healing, and when that mechanism was destroyed, Rapunzel still had the healing ability – it just turned towards tears.